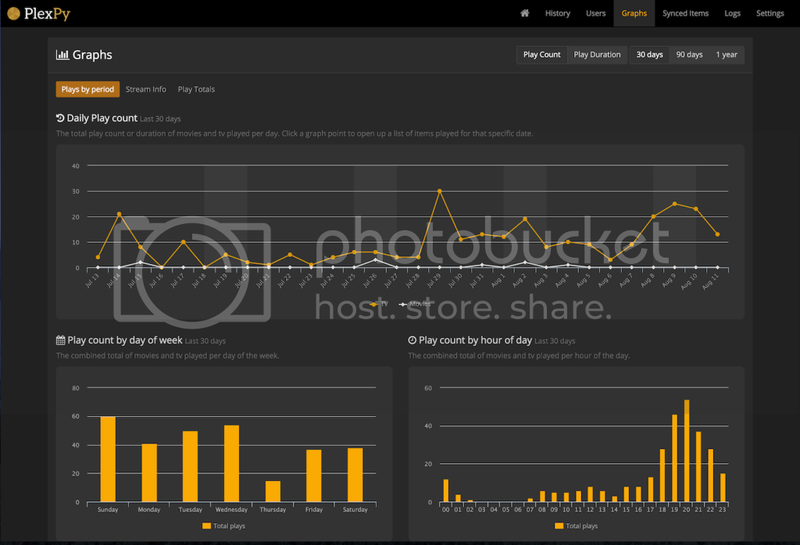 A python based web application for monitoring, analytics and notifications for Plex Media Server (www.plex.tv). [*]Important : If you are using Headphone, change the port 8181 to 8282 in the headphone settings. [/color][/size]PlexPy will be installed to /opt/plexpy. This installation assumes PlexPy is installed to /opt/plexpy. Make sure all paths are correct and accessible. A common mistake is that a daemon user has no read and/or write permissions. 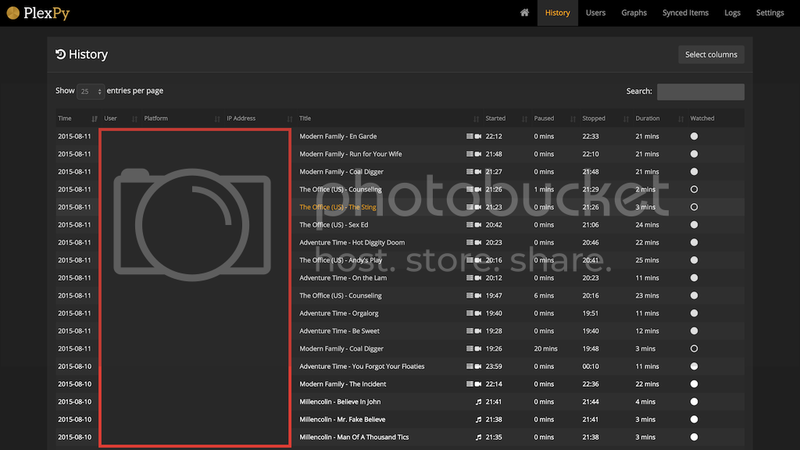 Adjust settings in /etc/default/plexpy. See the comments in /opt/plexpy/init-scripts/init.ubuntu for the list of parameters. OMV3 Distro + OMV-Extra + Docker + OpenVPN = Unlimited possibilities! The post was edited 3 times, last by NeurOSick ( Sep 15th 2015, 3:54pm ). It looks pretty simple to make a plugin. I am busy helping my daughter to improve her English. It is taking up a lot of my time. Maybe Miller has the time. I think Aaron is busy too. PS- Miller the TeamSpeak plugin has been a godsend in helping my daughter. Thanks for that plugin. Instead of a separate plugin, could we not have an option in the plexmediaserver plugin to enable this for those who would want to use it? The post was edited 1 time, last by jhmiller ( Sep 13th 2015, 10:12am ). Instead of a separate plugin, could we not have an option in the plexmediaserver plugin to enable this for those who would what to use it? Yeah, it makes sense for people that would like this. I have added Plexpy into the plexmediaserver plugin, this allows the user to install/uninstall it and also set their preferred port. At the moment there is no package in the repo but if you would like to help test you can manually install it. After installing remember to refresh the OMV page so that the new settings will be loaded. If you do decide to test please leave some feedback so that if it works for you or not. 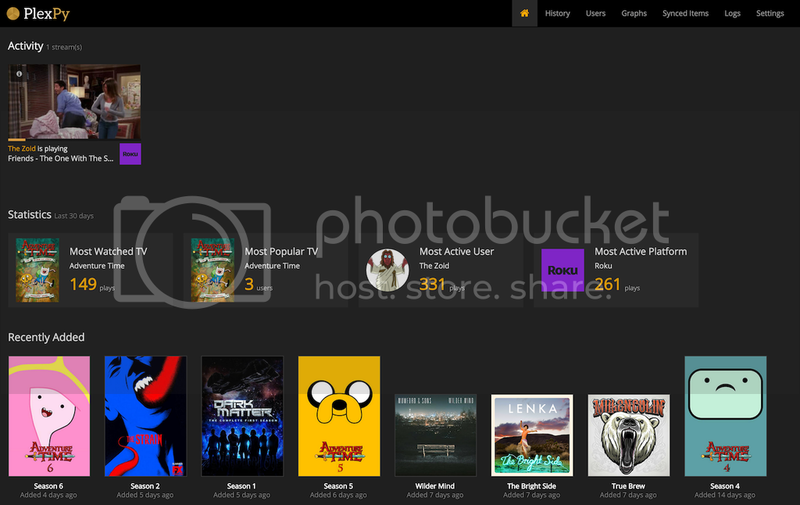 I'm not using PlexPy. Or what did you want me to look at? Just to check the code over. It is not one of the plugins that I started so would not feel right about releasing a new version without yours or Aarons input. I'd say Aaron is better suited for that than me. I'll try to test it later tonight.